A few hundred yards north of last week's Limekiln Creek Bridge is the Pitkins Curve Bridge and adjacent Rainrocks Rock Shed. 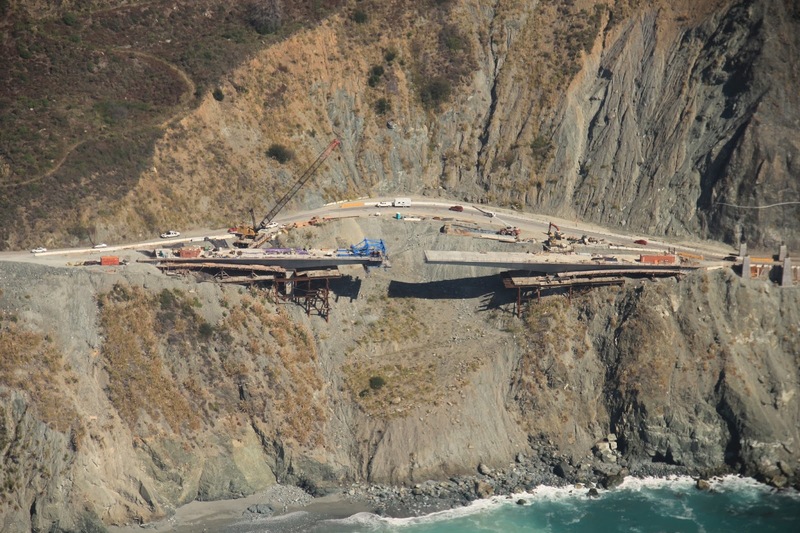 As I've previously discussed, addressing all the slides in Big Sur is slowly turning the Pacific Coast Highway into one long viaduct. We saw how the Rocky Creek Viaduct was built to protect the highway from erosion of the surrounding soil. Similarly, Pitkins Curve Bridge and Rainrocks Rock Fall were built to prevent the rockslides from causing accidents, closing the highway, and from requiring continual maintenance of the road. The photo above shows Pitkins Curve and Rain Rocks before the new construction. 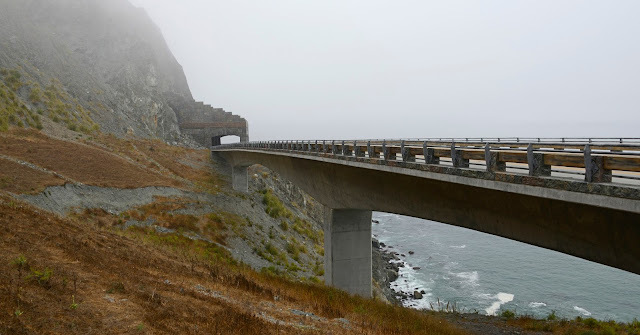 A cost-benefit analysis showed that Caltrans could save $115 million by building a bridge away from the slides and a rock shed that pushed the slides away from the road (see photo below). Pitkins Curve is a 620 ft long cast-in-place, post-tensioned, variable depth, box girder bridge. The 155 ft long side spans were cast with falsework and the 311 ft long main span was segmentally constructed. The two piers are supported on pile caps with four CIDH piles socketed into rock (along with tie downs). Construction was completed in 2014 and I believe that Caltrans engineer Mike Van de Pol was the designer (however, engineering is a collaborative effort and so I might be mistaken). More information on the design and construction of this bridge is available online. I drove out on Friday (on July 15th) to photograph the bridge (top photo) but the fog coming in from the Pacific was so heavy I could barely see it from 20 yards away. Also, this was the only location (standing on the slide) where I could see the bridge. The Caltrans photographer who took the photo above (during construction) must have had a helicopter at her disposal. I took a photo of the rock shed (below) but the simulated rock makes it look like a prop for a Hollywood movie.